Home organization can be a challenge. Home organization when you have kids can be a big challenge. While you always have the helpful option of renting a storage unit for extra kid stuff you don’t want to throw away, you still have the rest of your kid’s rooms to keep in order. Okay, this isn't really a project, but it's still a good idea. They make benches that serve as storage, bed frames that have drawers, and other furniture options that allow you to save space and stay organized. Pegboards are for more than tools or kitchen utensils. Hanging one in your kids room can be a fun way to organize using caddies or hanging baskets to store smaller items. It's a known fact that all children love pickles and peanut butter. Maybe not together, but none the less. When you have a few empty jars built up you can clean them out, label them, and use them to store art supplies so markers and crayons don’t get everywhere. We loved this DIY stuffed animal swing project that we came across. All it takes are a few pieces of wood, a clothesline, some hooks, and a little bit of time to create a fun hanging home for your little one's furry friends. Did you know they make plastic storage bins that fit under the bed? Using these for toys, textiles, or other things that lead to bedroom clutter is a helpful and easy undertaking. If you want to make it more fun you can have your kid help you “kick out the monsters under the bed” before you replace them with the bins. Do you know what the worst thing in the world is? Stepping on a tiny toy like a matchbox car when you don’t know it’s there. Ouch. This awesome - and easy - matchbox car (or general tiny toy) hanging PVC pipe storage project is not only easy to make, it looks cool and modern too. Wine crates, apple crates, old crates. All you need to secure them are anchors and a few screws, and suddenly you have chic, cool, and fun hanging storage for your kids room. You can paint or wallpaper them, too, to add extra flair. Lacy, gently wafting curtains. Seriously, though, if you want to cover up closet clutter but keep style, just hang some fun fabric curtains over the door or over a cluttered bookshelf to add visual interest and a place to hide mess. 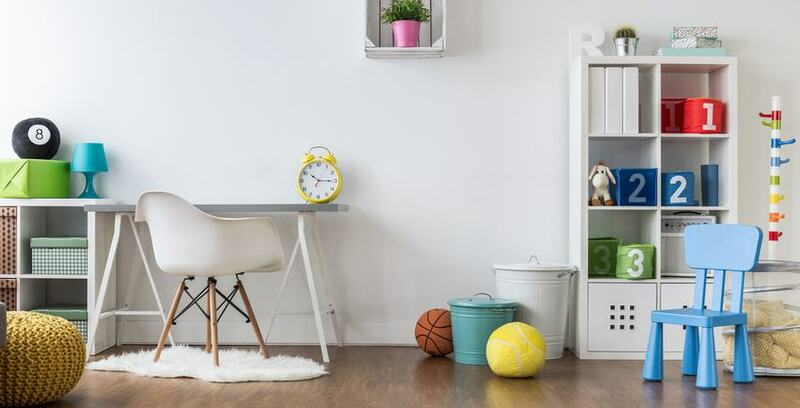 Organizing your kids rooms doesn’t have to be a challenge. In fact, when you do projects like these, it can be really fun for you and your family. Plus, once you’re done purging the kids rooms but can’t bring yourself to throw away some of their favorite things from, that’s okay! You can put it away in a storage unit from Storage Direct until they have their own kids!